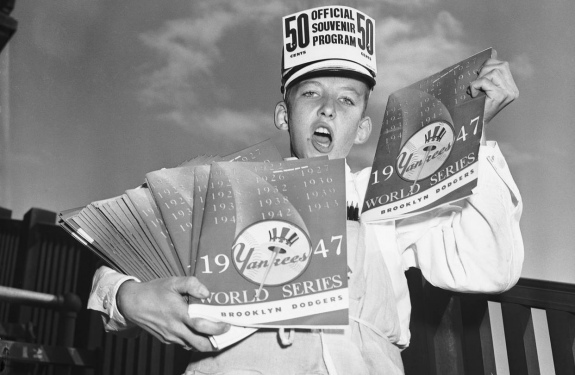 A kid sells programs for the 1947 World Series, only the second time the Brooklyn Dodgers and New York Yankees battled for baseball greatness. Tonight, the New York Yankees (100-62, .617) are fighting for their playoff lives against their legendary rivals, the Boston Red Sox (108-54, .667). Trailing two-games-to-one in the best-of-five American League Division Series (ALDS), the Yankees asked Bucky Dent to throw out the first pitch prior to this evening's Game Four at Yankee Stadium. All but one of the potential World Series rematches will be wiped away if the Red Sox eliminate the Bronx Bombers. But hold that thought. The Colorado Rockies (91-72, .558) and New York Yankees quickly jettisoned the Chicago Cubs (95-68, .583) and Oakland Athletics (97-65, .599) from the postseason during the National League and American League Wild Card games. Then the Milwaukee Brewers (96-67, .589) and Houston Astros (103-59, .636) swept their respective LDS opponents, the Rockies and Cleveland Indians (91-71, .562). The Los Angeles Dodgers (92-71, .564) needed one more than the minimum to eliminate the Atlanta Braves (90-72, .556). As mentioned earlier, a Red Sox win this evening will drastically reduce the amount of potential World Series rematches. Prior to the NL Wild Card Game, when all 10 teams were alive, 27 different rematches were possible. At the time of posting, the Red Sox were holding a 4-1 lead in the top of the seventh inning.